The Role of art and the artist in contemporary society. How do you inspire people through your art? What role should activist art have in society? Tracey will talk about a variety of activist arts campaigns and projects she has instigated and worked on from eliminating Saatchi's Club 18-30 Billboard poster campaign profiled in Manchester to the Coca-Cola Nazi Advert Exhibition which began a world tour following an investigation into the deaths of eight Coca-Cola bottle workers in Colombia. She will detail her recent activities as part of the 100 Acts of Minor Dissent, an exhibition with friend and fellow collaborator Comedian Mark Thomas at Sheffield Millennium Gallery in May 2014. 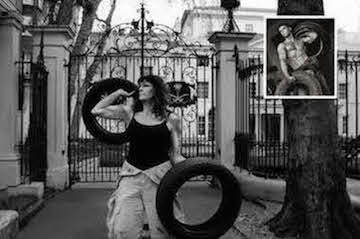 Acts included posing as a female 'Fred with Tyres' outside the Saudi embassy in support of Saudi Women Drivers; and subverting the lettering advertising current films on the front of Curzon cinemas to support a campaign for union recognition. The photographic artwork is from an exhibition/show I did with Mark Thomas (political comedian); Greg Matthews (designer) and Rikki Blue (film maker) called 100 Acts of Minor Dissent at the Sheffield Millennium Gallery - Sheffield in May 2014. It is a mock-up based on the iconic photo shoot 'Fred with Tires' by Herb Ritts. The activity I'm embarking on is one of the protests we did outside the Saudi Embassy referencing their ban on women drivers. On 8th Oct the Telegraph newspaper reported that the ban is being reviewed & women over 30 wearing no makeup will be allowed to drive between 7am to 8pm Sat to Weds & 12pm to noon thurs & Fri - This will be unaccompanied by a male relative in the city but accompanied by one outside. If you're planning some DIY and you live in London, don't even think of walking home from the shop clutching a new plank of wood. Because thanks to another antiquated law, while it's fine to load planks straight into your waiting car, it's an offence (maximum £500 fine) to carry a plank across a pavement. It is also against the law to 'roll or carry any cask, tub, hoop or wheel, or any ladder, plank, pole, showboard, or placard, upon any footway, except for the purpose of loading or unloading any cart or carriage, or of crossing the footway'.